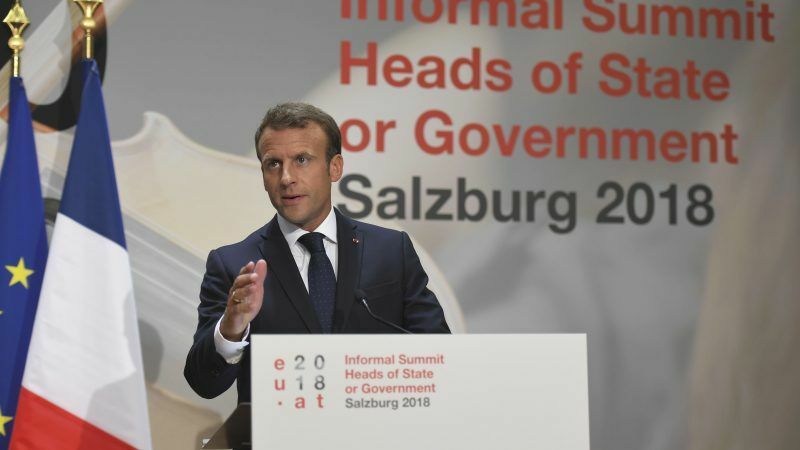 epa07034780 President of France Emmanuel Macron speaks during a press conference after the European Union's (EU) Informal Heads of State Summit in Salzburg, Austria, 20 September 2018. EU leaders poured cold water on Theresa May’s Brexit plans at an informal summit in Salzburg on Thursday (20 September) but they remained divided over migration, with French president Emmanuel Macron launching a broadside at the EU’s ‘troublesome’ member states. “Yes, there is a crisis and tensions surrounding migration,” acknowledged Macron as he held his final press conference at the end of an informal EU summit. “But who generates them? Those who are telling us I don’t want to stick to humanitarian law and international maritime law and refuse to let boats dock on its ports,” Macron said. “Those who are telling us I am part of Schengen, I love Europe when I can benefit from the structural funds, I love Europe when it gives me money, when it generates prosperity to my people, when it allows my workers to make a better living in neighbouring countries, but at home, I will not allow one single migrant, one single refugee into my country,” he continued in a clear reference to Italy’s Matteo Salvini, Hungary’s Viktor Orban and the Visegrad Four. These people do not respect any rules, they are the ones creating mayhem, not the rest of the community, he insisted and added that Europe is no ‘menu à la carte’. 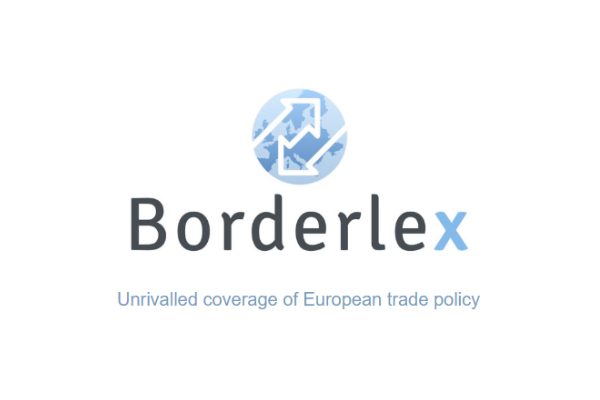 But the question of ‘burden sharing’ remained unsolved with some member states such as Austria rejecting it while Greece, France and Germany are among those pushing for it. “What we must strive for is to make sure that less people are leaving for Europe illegally through the Mediterranean sea. This can be done by building strong partnerships with North African countries and Egypt,” said Kurz, adding that Egypt was efficient in fighting illegal migration. Commenting on the Brexit negotiations, Tusk said he was a little more optimistic by the summit end than a few weeks ago. “But I can’t rule out the possibility of a no deal. We are not ready to compromise on our four freedoms, on our single market as well as on the Irish borders,” he insisted. He said that an additional summit will be held in Brussels on 17-18 November in order to finalise the Brexit agreement should no substantial progress been made at the next EU Council meeting mid-October. As for European Commission Jean-Claude Juncker, he said that that the EU executive has prepared ‘in detail’ for a ‘no deal’ Brexit, “so be happy, don’t worry”. Speaking in a neighbouring room, Macron was blunt, describing Theresa May’s Chequers plan as unacceptable, ‘especially economically’. “We must defend the single market and its coherence. The Chequers plan cannot be a take it or leave it plan,” he stressed. The French president insisted that the EU strategy will not change. Asked about the Eurosceptics and critics, he replied with a question: “Who put us in this Brexit situation? The same persons who are today telling you that Europe is going from crisis to crisis”. “Brexit is the choice of the British people pushed by those who predicted easy solutions. Brexit is telling us one thing: it is demonstrating that those who want to explain to us that one can do without Europe easily, that it will go very smoothly and that it will bring a lot of money are liars,” said Macron. Less than an hour after the Salzburg summit ended, AFP quoted Theresa May as saying that she will unveil new Irish border plan “shortly”. This speech is total unmoral insanity. Macron is a hater of atheist, christians, jews, etc. Schengen has nothing to do with an obligation to allow Muslim colonists to set up camp in your country and neither do structural funds. But if a country is forced to chose between the EU and its continued existence as the country populated by its native population then it is time for the EU to die along with with its propaganda for ‘human rights’ (a.k.a. as obligation of allowing mass Muslim immigration). You are talking nonsense. If the unfortunate migrants were spread around the EU it would work out fine. “Muslim colonists” – oh dear – are you sure you were sober when you wrote that? Unfortunate as they may be. They will have large families when then set up camp in Europe and they will raise their children as Muslims. All the while all whites (including Americans), a.k.a. Europeans have sub-replacements birthrates. In a generation or 2 (which isn’t all that much) that will profoundly change the ethnic and religious makeup or the receiving countries….and don’t think they are going to be ‘all liberal’ about past ingressions like colonialism, ‘white racism’ or interventionism in the middle east! They are going to feel like ‘its payback time honky!’. Your grandchildren are going to be a marginalized, powerless minority in their own ancestral territory….thanks to their ‘moral’ granddad. And I repeat. European integration has NOTHING to do with accepting illegal immigrants from outside of Europe. Nobody EVER entered the EU for the purpose of getting a share of uninvited men coming to Europe. You are 100% correct my friend, it is indeed a colonisation, and Europeans need to wake up to the reality. Unfortunately they are moving towards this awakening at an all too glacial speed and people like Mike Parr are very much part of the problem. He thinks he has staked out the moral high ground, but he stands upon a pile of ordure, and will ultimately sink beneath it. Macron should concentrate to solve the economics problems of France first. And meanwhile he should stop with neocolonialist mentality with respect to Eastern and Central Europe. France got access to their markets and nobody is obliged to follow Macron directions. Africa was a colony of France, not Eastern Europe. You are absolutely right. All Macron does is create strife within European Union because some of the member states do not approve of his federalist ideas. He chastises Italy for not accepting ships carrying immigrants, but you know what? He didn’t let them in either – Spain did. To be realistic, either a multi-speed EU or a split up into those who believed in share sovereignty and those who hang on to national sovereignty. The Eastern countries around Orban + Iltaly can form their own organisation. Pointless arguing and bad relations. If the EU would actually incorporate some moderate ‘ blood and soil’ into its DNA that would work but the EU has no soul. It is too universal and does not connect with the reality of family, ethnicities, traditions and their interests. Life is not all about economics. In fact GDP and lofty ideals means absolutely nothing compared to continued biological existence of ethnic groups or human freedom. Your “reality” of ethnicities and traditions is an imagined reality. Not imaginary, but nations are imagined communities, i.e. socially constructed. If anything, the EU provided more human freedom. Free movement of people, goods and capital and the freedom to provide services all apply to individual humans. Add to that protection of personal data, the right to liberty and security, respect for private and family life, consolidation of the freedom of thought, conscience and religion, freedom of expression and information, freedom of assembly and of association, freedom of the arts and sciences, right to education, freedom to choose an occupation and right to engage in work, freedom to conduct a business, etc. Ethnicity is a sense of common ancestry based on cultural attachments, past linguistic heritage, religious affiliations, claimed kinship, or some physical traits. There is not really anything biological about it, as it is again a social construct. Calling it ‘continued biological existence’ is exactly the kind of invented reality that makes nationalism viable. Cheers man. Macron’s laughable Salzburg speech only shows that he is far bigger populist than V4 and Italy’s governments all lumped together. Also he constantly exhibits a rather unfortunate neo-colonial attitude towards Central European member states. As if he did not know that structural funds are not tied to accepting migrants or asylum seekers into your territory. When V4 countries joined European Union there was no say about changing their ethnic/cultural makeup to receive European funds. And if it was so, V4 Poland would get a record amount, because despite government’s loud proclamations about ‘tight migration policy’ in the last few years it has let in over a million immigrants from all over the world and is preparing to invite thousands more. But, apparently Macron does not know this and constantly chastises Poland for sending millions of their citizens abroad and not welcoming a single immigrant back. And BTW – Poland is also accepting refugees and helping them on the groud, in the Middle East. When V4 countries joined the European Union, they stated that they wish to affirm the European identity, confirm their commitment to progress towards an ever closer union among the peoples and Member States. They agreed to grant Europeans the right to freely move within the EU’s internal borders, which would logically change the ethnic and cultural makeup of every member state. Surely, there is no requirement to take in migrants from third countries, and I agree that Macron’s tone is out of order when trying to find solutions. But the argument of changing cultural makeup is not quite valid and is merely appealing to emotion. Hence the tone of the debate is wrong on both sides.